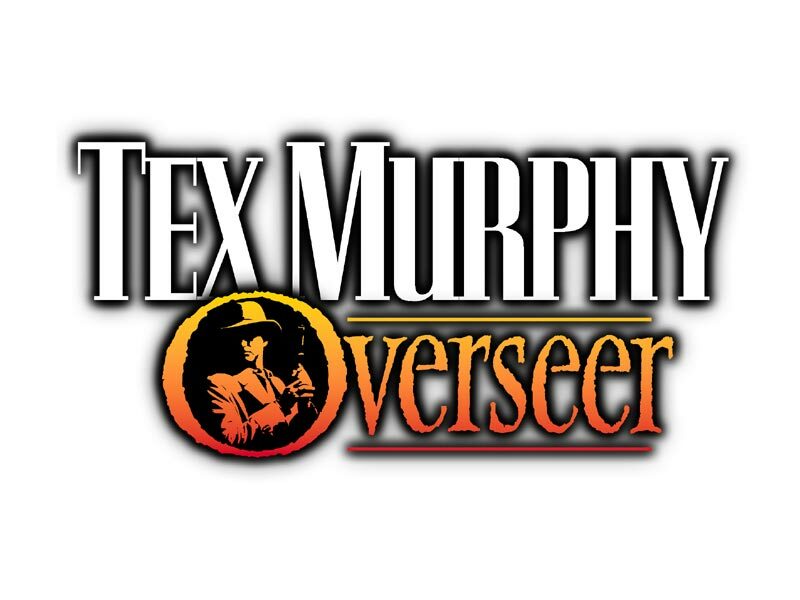 This is the fourth series of Tex Murphy, the unluckiest PI in the world. This time, the story is about his first case. The client is drop-dead gorgeous and her father is just plain dead of a suicide. Tex has to proove that this is not a suicidal case. 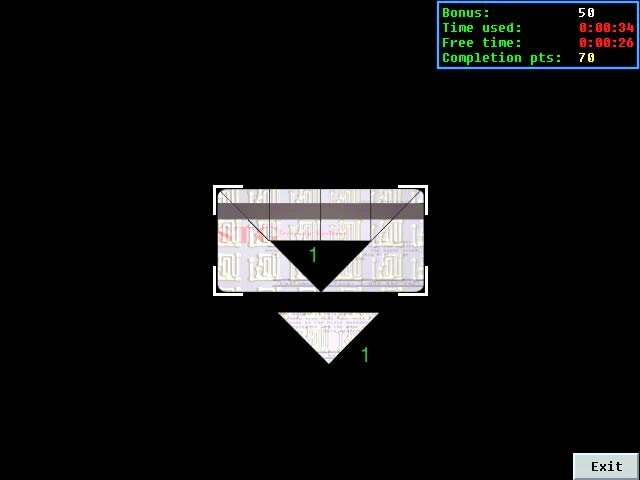 The first part of the hints is just to give you the main idea on how to solve the game. So, it'll not tells all the points in the game. This will make sure that I'm not ruining your game. But for you, the score hunters, I provide the special section that will show you all the points in the game. This special section called the SCORE LIST. For the conversation option I use A, B, C, D, E, and F order from top to bottom choice of conversation. So have fun and keep on gaming. NOTE : Use this walkthrough on the GAMER mode only !!! Addition : The magnet location for Big Surf Lodge puzzle. 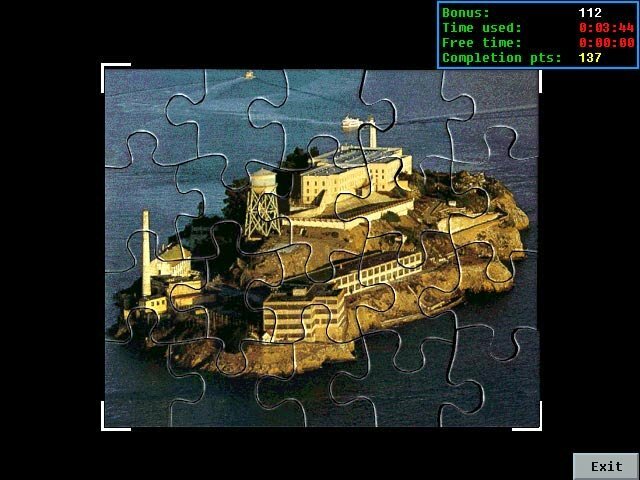 Total solution of the Brick Cell puzzle in ALCATRAZ (The one that many people feel very hard to solve) !!! 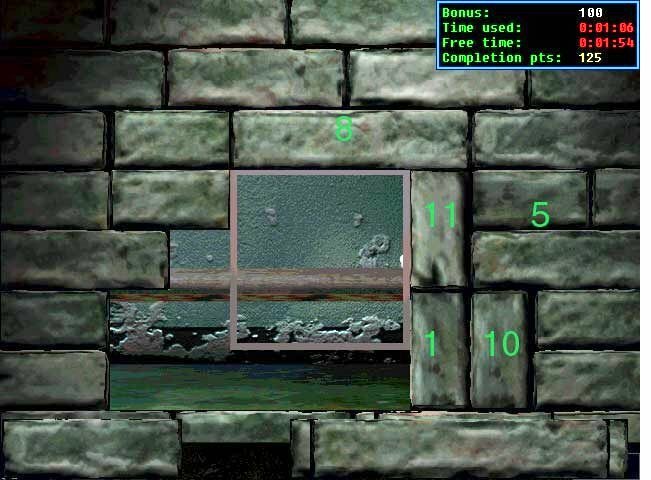 The cheat code for all puzzle is '911'. 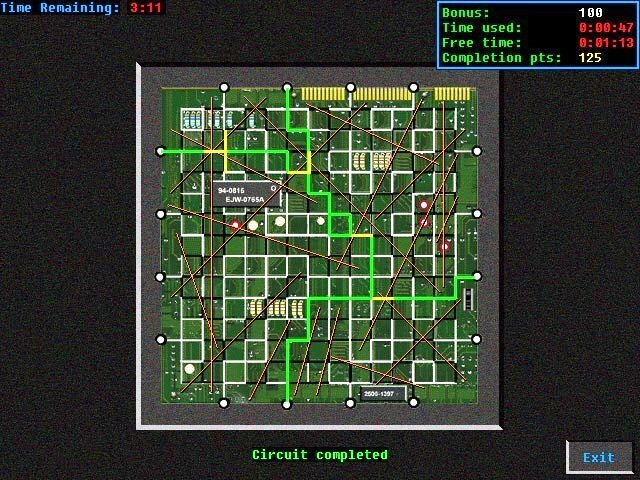 Thanks goes to Erik Gos for his special addition on cell lock control panel puzzle (in Alcatraz) and GAMBIT password. Q : What is my mission all about ? A : The key to trigger the mission is at Tex's bedroom. Try to play the Parcheesi game. Q : I can't go to Sylvia house. What should I do ? A : Visit Eve Clements first, ask her about Carl Linsky. After you know about his suicidal note and personal belongings, you could go to Carl Linsky house. Q : How to make Eve Clements talk ? A : Choose any order until you trigger the key sentences (look below). This is one of the shortest way. "Obviously pleasant", "Laugh it up", "Make an offer she won't refuse", and "Resort to charity". The last two option are the ones that let Eve giving all the information you need. 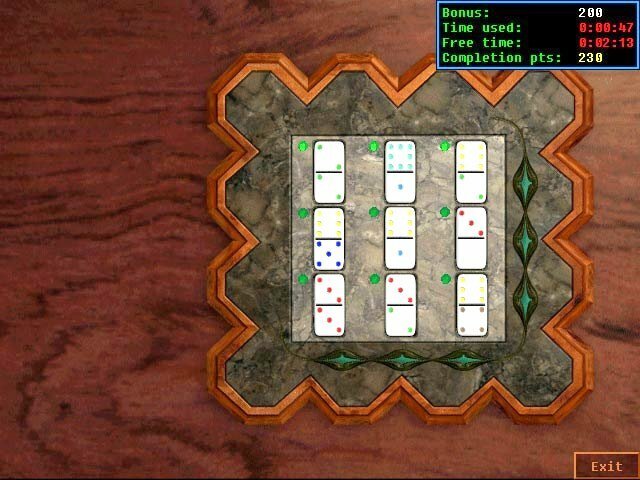 Q : How to solve the dominos game ? Q : Where can I find the first clue for Carl's case ? A : Find out about his closest friend : HIS GIRLFRIEND. The address to her house can be found inside the bedroom. Read the love note on the desk. Her name is Delores Lightbody.Open the drawer on the left nightstand. Get the address book and read it. Q : How can I make Dolores to speak ? A : Choose any option that make her flatterd. If you could "milk" her about the info, you're in the right track. You'll know about her hattred to Sylvia. Go back to Carl's house and see what happens. Note : If you want to have full points (8) from her, you must look at the chess piece inside Linsky's bedroom. Q : What should I do with the keys in the brown envelope from Sylvia ? A : Go to attic. Enter the small room at the back. Unlock the locked credenza at the corner with the small key. Inside you'll find a lease of a warehouse. Read it (it'll trigger the address to the warehouse). The other key will be used later on. Notes : The small note inside the iron filling cabinet and the one inside roll top desk will explain more about the case. Click here for full score info. Q : What should I find in this warehouse ? A : There are 3 main things to find. First, the secret safe. Second, some faxes and notes that tell several names. The last one is the sleeping pill. These things will anvanced your quest. Q : Where is the secret safe ? A : This is a tricky one. Climb the stepladder on the corner. Move the box on the top of the shelf. Move the calendar to reveal the safe. Q : How can I open the safe ? A : Use the combination from the dominos game. The number is 498. Inside you'll find insurance policy and card reader. Read the insurance. Q : Where are the faxes and the notes ? A : The important fax, the one with initial S.F. on it, is inside the middle drawer of the filling cabinet. Inside the bottom drawer you'll find Linsky's project notes. There's an article and deposits slips inside the drawers of the drafting table. An important letter from Wanda Peck. And the last one is quite hidden. Move the woodboard near the computer. Behind that board you'll find a strange note :"HIP S.O.B.". Q : Where is the sleeping pills ? A : It's under the pillow. Read the bottle and it'll tell you about an important clinic. Q : How can I use the computer ? A : You can't do that now. You need a security card to access it. The security card is inside the first aid kit box on the back wall. Get the kit and open it. Inside you'll find fragments of security card .... but ... one fragment is missing. Q : Who is S.F. ? A : Dolores Lightbody knows the answer. Visit and ask her. Q : How can I end day one ? A : Go back to your office and play the message from Sylvia on the vidphone. Q : What should I ask to get full points from the clinic ? A : Choose any order (the good one is B, B, C). Then ask about De Leon clinic (from the sleeping pill bottle) and C.A.P.R.I.C.O.R.N. This will lead you to 4 pts. Q : How can I get information from C.A.P.R.I.C.O.R.N. representative ? A : Don't make her sick and tired with your "love" affection. Speak directly to business with her (the best option is C, A, C, A). Ask her about Overlord (from the HIP S.O.B note), CAPRICORN, and Low and Order party. It'll gives you max 3 pts. Q : Where can I find Sonny Fletcher ? A : Use vidphone in your office to get his bad record. Get his fax. Ask about his record to Eve Clements. She'll give you his address. Talk to Sonny and he'll give you a bishop. Choose A, C when talk to Sonny. Q : What the use of the bishop ? A : It's the 'key' to use the computer in the warehouse. Look at it to reveal the missing piece of the cardkey. Combine it with the fragments and then you're set to use the computer. Use the card reader to hook on the computer. 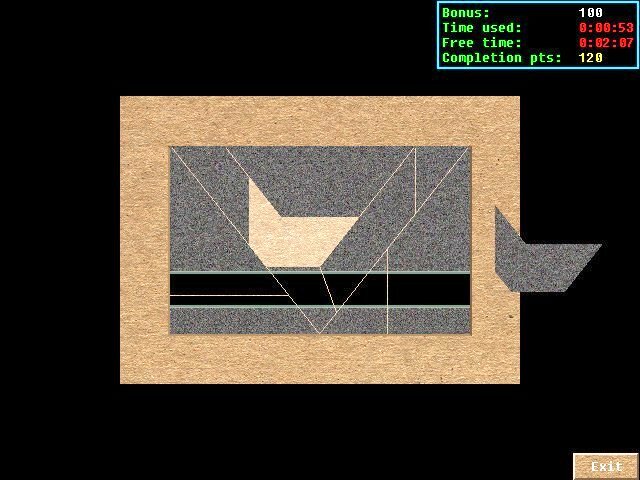 Q : How can I solve the fragments puzzle ? Q : What is the password of the computer ? Q : How can I open the safe in Fresno office ? Set SF time : 6 p.m. Paris time : 3 a.m. Sydney : 12 p.m.
Set Paris : 2 p.m. SF : 5 a.m. Sydney : 11 p.m.
Set Sydney : 9 a.m. SF : 3 p.m. Paris : 12 a.m.
Q : What to do next ? A : Go to Sonny Fletcher house. He left something for you. Q : What must I do in this ruin ? A : You have to find 8 bricks with symbol on them. Q : Where is the bricks ? 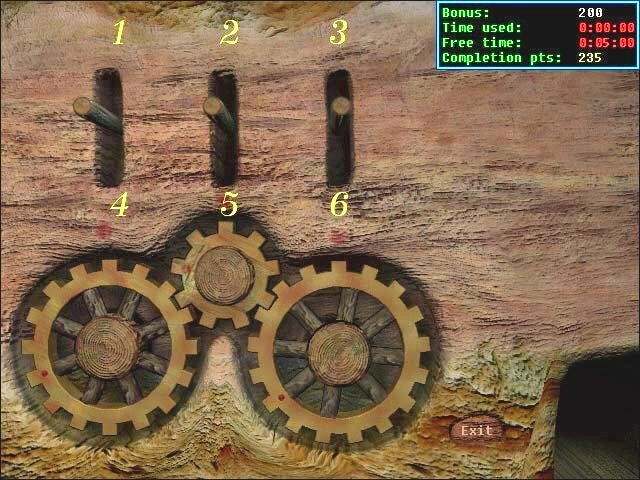 Q : How to solve the cog and lever puzzle ? A : Do this in order. Pull middle lever into 2, right lever into 6, left lever into 1, right lever into 6, and finally left lever into 1. Look at the picture below. Q : How to take the brick from the snake in the ceremonial chamber ? A : Use a bait and a little trick. Get the line on a stick from the inner chamber (through the top left door behind the right door from main entrance). Get wooden box from the opening (area behind the right door). Combine line on a stick, mouse, and the wooden box to make the Scout Trap. Use the trap with the snake. Q : How to take the brick in the pit near the main entrance ? A : Get the pipe from the inner chamber and the rope from the ceremonial chamber. Combine them and use it with the bucket in the pit. Q : What is the solution of the Anasazi God Brick Puzzle ? 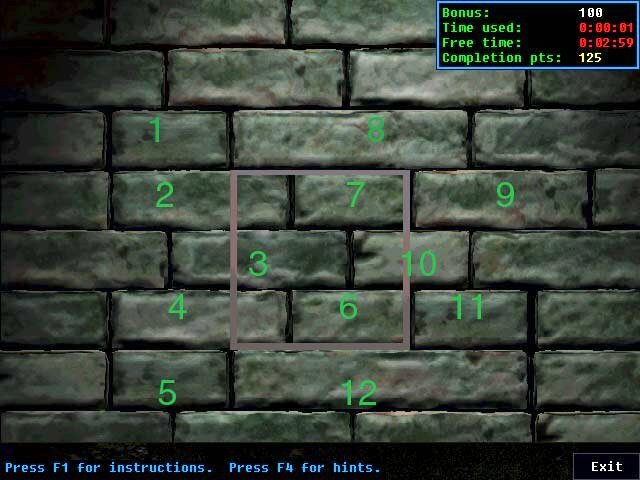 A : Look at the picture below, put the bricks in their appropriate number. This is only one solution of many. Q : How can I cross the collapsed bridge ? A : Make a new bridge. Collect leather strips from Anasazi corridor, poles from the ceremonial chamber, and long poles from the opening (near the box). Combine them all to make ladder. Use the ladder to cross the pit. Q : How can I open the iron door ? A : Collect coin, pocket watch, and glasses on the floor around you. Examine the watch to get the spring and the glasses to get the tape. Use coin to open the compartment beside the iron door. Use spring to connect the wire. Use tape to isolate the wire. Q : How can I operate the computer ? A : You need a password key first. It's kept inside a secret compartment below the computer. To open it, you need a special note for the soundlock. Look for the hidden camera. It has recorded the sound while Bosworth opening the compartment. The passcard reader is inside the cabinet with a lamp on it. Q : Where is the hidden camera ? A : It's the smoke alarm. Examine it closely and you could take the disc from behind it. Get the video disc player under the bed. Use the player to view the disc. Q : What is the sound combination ? A : Red, Yellow, Blue, White, Red, Yellow, and Green. Q : What is the password for the computer ? A : It's written on the printout beside the equipment table. It has been scrambled. The password is : CHECKMATE. Q : What is the name of the project that Lisky was working on ? Q : How can I meet Mr. Gideon ? A : Frank Schimming know his address. Go home and you'll receive a fax from a "friend". He'll give you Frank's phone number. Contact him using the vidphone. Choose this combination as one of the solution : A,A,C,B. Ask him about Mr. Gideon. Q : Where is Jorge Valdez ? A : Ask Mr. Gideon about his address. He know something about Law and Order party. Robert Knott's name will appear on the list. Q : How to make Valdez talks ? A : Open the conversation with chess subject and go straight with him. Choose this as one of the solution : A,B,C,C,A. He knows something about Poisoned Pawn and link to Val Davis lab will be trigger sometime after this.Go home and use the vidphone. Q : How can I get the small box from the ape ? A : Try to drug it first. Combine the banana and the sleeping pill. Get the ten foot pole near the chamber door. Give the drugged banana to the ape. Q : How can I deactivate the gas chamber ? A : Get passcard reader from the floor in the gas chamber. Connect it to the computer and insert passcard A. The password is : QUEEN. Q : What is the function of the microscope beside the computer ? Q : How can I find Big Jim Slade ? A : Go back home and get the telegram on the floor. Sonny Fletcher has some info for you. Go there and he'll tell you Slade's address. Unfortunately, Sonny will die after this. Slade has wounded him pretty badly. Q : How can I get inside the Surf Lodge ? 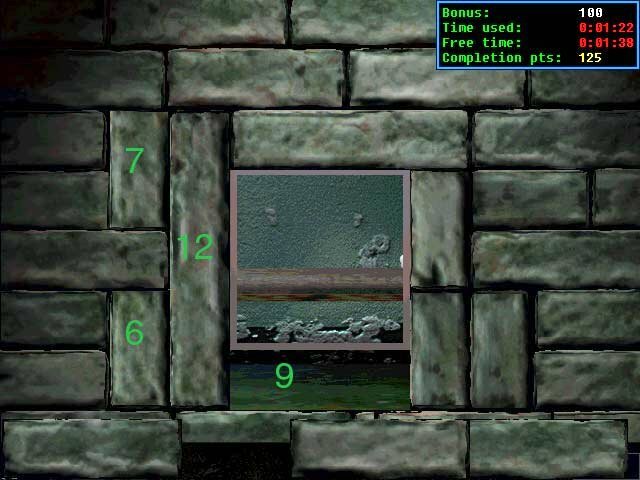 A : Examine the counter through the small opening to the right of the door. Combine the magnet (you have it along the list beside the equipment table in Bosworth Clark's lab, remember !!!) and the measuring tape. Use magnetized tape to get the key. Use the key to unlock the glass door. Q : What should I find inside his lodge ? A : There are several things to search in this room, for example : clothes in the wardrobe, wallet on the table, the chart under the pillow, the Gideon bible and the Marvey's tube (inside the kitchen drawers in the next room ). Note : When you're collecting these things, be careful because the last thing will trigger the phone to ring. In mycase, the Marvey's tube. Big Jim Slade will come out from the bathroom in any second. Q : Big Jim Slade always caught me, what should I do ? Q : How can I unlock the cuffs on the suitcase ? A : The key is in his coat in the bathroom. As soon as Slade walks to the kitchen, go quickly to the bathroom. Get his coat and search it. Don't forget to put it back. This will call back Slade. Move the curtain on the bathtube. Hide behind it and close the curtain again. Wait until Slade comes back to the kitchen. Get out and use the key to unlock the suitcase. Q : What is the combination to open the suitcase ? A : Look for his favourite number (6). The answer lies on the lottery card which you've picked up from his wallet. The combinations are : 613, 222, 731. Q : Slade always caught me after this. What should I do ? A : Act quickly, get out as soon as you can. Go back to your office. Q : How can I solve the words puzzle ? A : Combine the bible with the code. The number that shows represents chapter, verse, and the position of the word from the left. The answer is : POST OFFICE BOX NUMBER 969. Q : Where is the post office ? Q : How can I get rid the guard ? A : Drug him. Use Mickey's vial with the coffee maker. Then hide in the mens room just right to the counter. Q : How can I enter Robert Knott's office ? A : The guard has the key. Take it from the floor near his leg. Q : What is the password for the alarm ? A : In the men's room, open the locker number 5 and 11. Get the credo and the brochure inside. Combine the credo and the coded message from the post office. The password is : PIRANHA. Q : What is the answer to the Credo puzzle ? MR SLADE PRIORITY TARGET : ROBERT KNOTT HIS OFFICE PASSWORD : PIRANHA. Q : How can I open the safe behind the lizard picture ? A : Open the locker number 17 in the mens room. The key lies under the chair inside Knott's office. Move the right chair from door view.Inside the locker you'll find an index card. On the index card you'll a strange number with word : ENOHPELET YM beside it. Read the word from right to left. It will spells : MY TELEPHONE 6980500406. Use this number with the vidphone on the table inside Knott's room. Again there will be a backward words. It spells : OPEN SESAME. Look at the telephone's button to get the number : 6736737263. This is the combination number to open the safe. A : Follow the address on the small note on Knott's chair. Q : Where is the key for the entrance door of Law and Order office ? A : You need a keycard for it. It lies on the small table in front of Knott's office. Q : How can I get the box inside the piranha's aquarium ? A : Move picture of the horse. Get bent nail behind it. Open the cabinet under the sink, just to the right. Get the wrench. Use it to release the metal hose on the faucet. Combine the nail and metal hose. Use it to get the box. Q : Where is the key for the cabinet inside Knott's bedroom ? A : Knott has it. Try to get out from the cabin and you'll meet Knott. Choose this word order as one of the solution : C,A,B,A,B,B. After he is shot down, get the key near his leg. Q : How can I escape from this ambush ? A : Make a diversion. Take the doll under the bed. Take the coat and hat from inside the locked cabinet. Combine them. Take the torch from the cabinet under the sink. Take the rope from the big cabinet in front of the sink. Get the log from the fireplace. Combine the log with the rope. Flip the switch beside the door to open the hatch on the roof. Put the doll on the window sill. 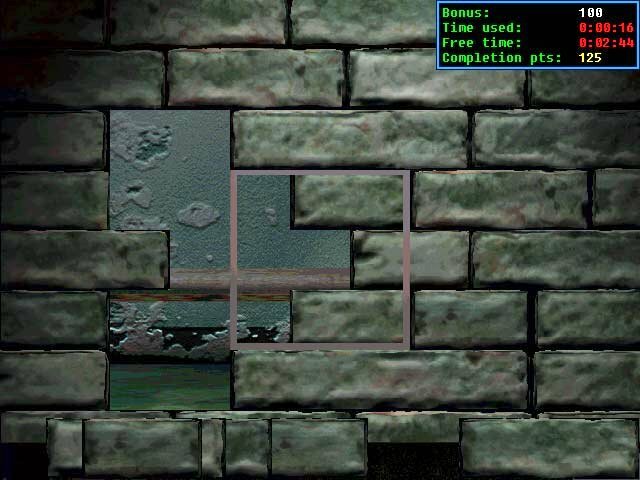 Throw the grappling hook through the hatch to escape. Tex will throw the torch to make the big explosion. Q : I don't have enough time to do them all !!! A : Do everything except the locked cabinet thing before you try to get out to meet Knott. This will save lots of your time. Q : Where is Greg Call ? A : Ask Eve Clement about him after Larry Hammond contact you again through the vidphone. Q : How can I solve this tag puzzle ? Q : Where is NEXUS ? A : Ask J. Saint Gideon for it. He'll show the way. Q : How can I operate the chip removal machine ? A : Get and read the chart beside the experiment chair first. Grab the keycard also. Get the syringe from the chip maker machine. Use the keycard with the card reader to the left of the front door. It will open the panel beside it. Get the N216 serum. fill the syringe with it, then use the syringe. Go to the chip removal machine and turn it on. 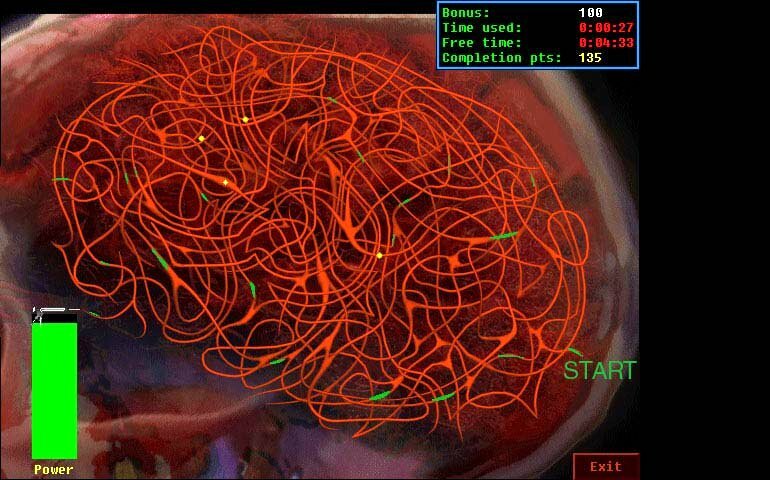 Q : How can I solve this brain puzzle ? A : Guide the serum to the chip in the middle and avoid that antibody. Look at this picture to help you. Follow the green trace from the start. Q : What is the password for Greg's computer ? A : The note from the Larry Hammond will helps you on that. See that Passcard D move. It's a Gambit move. The password is GAMBIT. Special addition note from Erik Gos to solve this puzzle : In the Fresno office you'll receive that UPEX package containing a note about 2 methods used by Greg Call, one of them being braille and the other one using every third or fourth word in a note. If you use the latter method on the note that is in the envelope Larry gives to Tex in the Nexus starting with Larry and then selecting every fourth word, you'll end up with a sentence saying that the first letters of the following words will give the password. 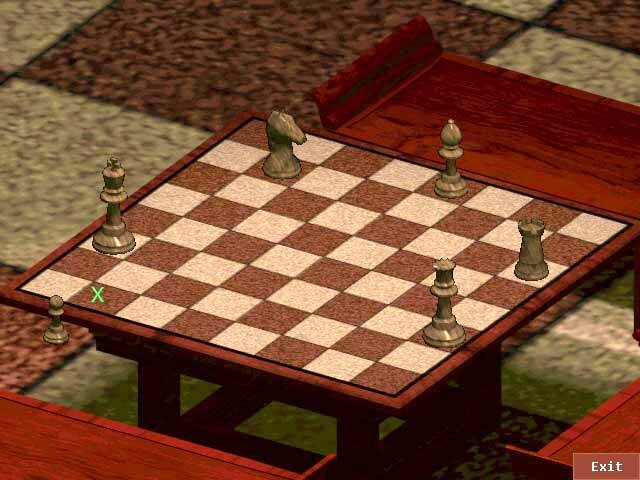 This way you can find it without knowing any names of chess moves. Q : How can I trick the guard ? A : Use picture trick. Get the music stand in the reception hall (through the door behind the counter), then combine it with the brochure you've got earlier from the Mens room. Then put this combination in front of the camera beside the door. Just put it on the camera, that's it. Q : Where is the entrance to John Klaus' lab ? A : It's behind the flag on the wall. Move it and use the high level ID card to open the door. Q : Where is the slot for the ID card ? A : Flip it with something. Get the chopstick on the bowl on the table, then flip it open with the chopstick. Q : What should I find here ? A : There are several things that you can find here. But the most important thing is his passcard. It's in the CD drawer below the computer on the right corner. Solve the cat puzzle and you get the passcard. Beside that, you can find memorandum, photo, referendum on the top of the shelf, and hear the tape recorder. Q : What is the solution of the cat's puzzle ? A : Look at this drawings for the answer. Q : How can I get out from this office ? A : Distract the guard first. From the note inside John Klaus lab (the one that on the floor) you know about Knott's extension number. Use the vidphone to dial his number. When it's connect, quickly get out from the room. Use the high level ID card to open the front door. Q : How can I operate the elevator ? A : Find the switch box first. It's hidden behind the small boxes on the back shelf (it's in front of the entrance door). Move the box, the flip the switch. Now you can operate the elevator switch. Q : How can I escape from Big Jim Slade ? A : You need two important things first. Oooopps, I hope you don't forget to take the penknife and the rock from the room downstair. The penknife is in the red box below the shelf and the rock is at the corner beside the entrance door. If you've bring them, it's good. Choose this option in the conversation : B,A,C,B,C,A,E,B,B. Q : How can I solve the chess puzzle ? Q : How can I get accross to the door at Gideon's gallery ? I can't touch the floor, it'll be alarmed. A : Use the ramp above the exhibition rooms. First, take the metal bar from the bedroom. Then take the 2 top railings (left and right) on the balcony. Combine them with the metal bar to make longer pole. Flip the switch on the right wall on the balcony to bring down the chandellier. Use the long pole to reach the chandellier. Q : How can I get pass this alarmed floor ? A : This is a little bit tricky, but you can get over it if you know the sequence. This is one of the solution. Look at this schematic to help you. The floor is formed by 4 X 4 section. I name this section from bottom left to top right by A1, B1, C1, D1, A2, B2, etc until D4. Remember the number increase from bottom to top, the alphabet increase from left to right. Top section is next to the exit and the bottom section near the entrance (balcony). The sequence is : 1(C3), 2(B3), 3(B3), 4(B2), 5(B2), 6(B2), 7(B2), 8(A2), 9(A2), 10(B2), 11(B2), 12(B2), 13(B3), 14(A3), 15 (Run like hell to exit door). Q : How to open the cabinet with sword picture on it inside Gideon's study room ? A : You need a special key for that. Check out the bookcase on the left wall. On the third shelf, you'll notice a strange book. Push it. Inside you'll find this metal cross. Put the metal cross on the cabinet, then solve the puzzle. Q : How can I solve the glass cabinet puzzle ? A : Look at this picture to solve it. After you solve it, you'll get a security card. Q : How can I unlock the locked doors in Gideon's hallway ? A : There are 2 doors. One at the north side and the second one at the south (there's a passcard combination lock beside it). The key to the north door is hidden safely inside Gideon's study. Look at the Dime-o-saur on the table. Insert your coin in it. Then take the small key. Unlock the door with it. 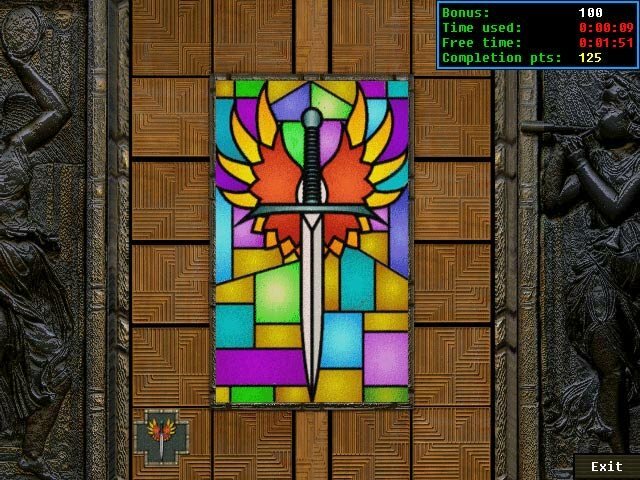 The south door's combination is inside the game room. Q : How can I solve the jigsaw puzzle on the table ? A : Look at this picture to help you. You'll get note with passwords on it. Remember these passwords for the final puzzle. Q : How can deactivate the alarm on the south locked door ? A : The answer lies on the pool table. Take the billiard balls (1,2,3,4,5,6,7,8). Strange the colors don't match with the numbers. 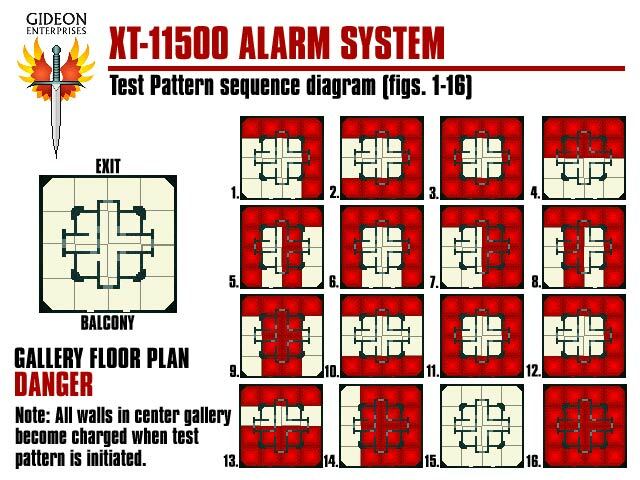 These are the combination for the alarm at the south door. The combinations are : Red(1), Blue(6), Orange(4), Purple(7), Black(3), Yellow(8), Dark red(5), and Green(2). Q : What is this monitor used for ? A : See that CD player below the monitor. Open it. Get CD#1 from the bench in Gideon's hallway (near the door to Gideon's gallery) and CD#2 on the top of the monitor. Play them. Inside CD#1, you'll see an important information for later. Q : How can I get out from Gideon's house ? Everytime I step to the door, it always tells me to override the alarm. A : Inside Gideon's control room, to the left of the door, there is a alarm override panel. Insert the security card to override it. Q : How can I escape from this cell ? A : Go through the wall on the wall. Of course, you have to create one first. Move the right bed then examine the brick on the wall. 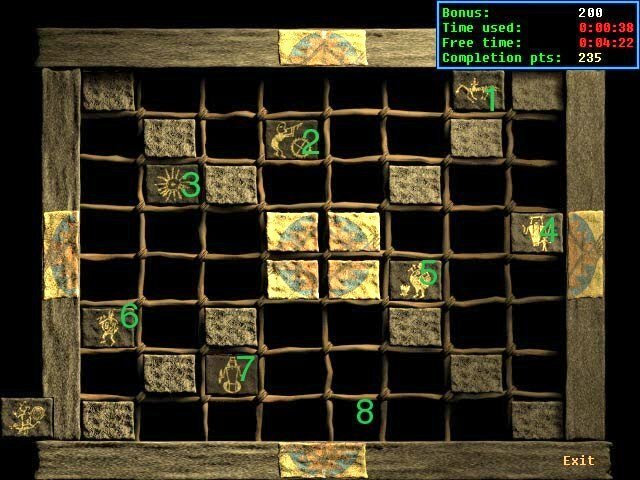 Q : How can I solve the brick puzzle ? A : Finally, this is the full version on how to solve the brick puzzle. The numbers on the brick represents the brick not the order to solve it. Clue : You can rotate the brick to hold down the brick above it. That's it, you finally solve it. This is only one of many possible solutions. Q : Now what ?? I'm stuck in another cell. A : This time is easier. See that shelf outside the cell. It looks very fragile. Throw something to it. Get the brick on the floor. Throw it to the shelf. The torch and tape will fall down to the tarp. Get the chain beside the bed. Use that to pull the tarp. Take the torch and the tape. Use the torch to cut down the cell bar. Q : How can get to cell block B ? 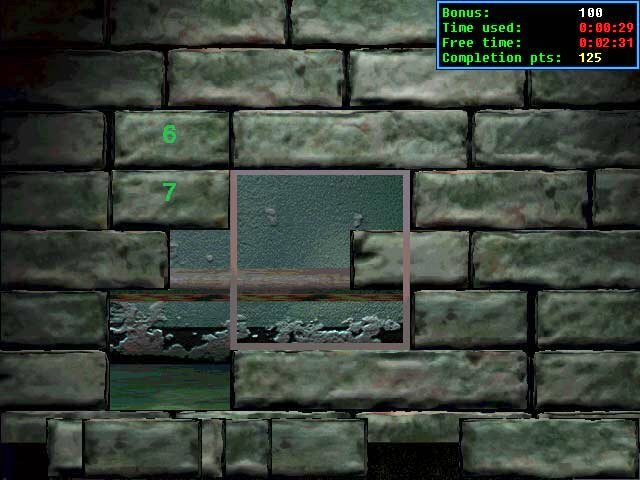 A : The key to cell block B lies behind the door to there. Get barb wire in the cell just near the door to the right. Examine this wire to make a hook. Use it to get the key. Use the key to unlock the door. Q : I always get caught by the droid. What should I do to avoid them ? A : Move swiftly from one open cell to another one. Everytime you heard the sound of the droid approaching, get inside the cell. They won't bother you if you're in the cell. Q : How can I unlock the door to cell block C ? A : There is a security card lies somewhere in this block. Use the cell key to unlock the cell to the right of the entrance. Get the passcard on the floor. Use this passcard to unlock the door to cell block C.
Q : How can I get the gas canister (hanging above the wall) at the end of block C hallway ? A : You need a screwdriver to get that. The screwdriver can be found in Alcatraz Dungeon below the cell block D. Use the screwdriver to release the gas canister. Q : Where is the key to cell block D ? A : The key is inside the cell (the second opened left cell from the end). Get the key from the wall and use it to unlock the door to cell block D.
Q : How can I use the control panel to open the cell in this block ? A : The answer is written on the door of the panel. (e+o=2, o-e=8). You have to solve that set of equations, resulting in o=+5 and e=-3. These are the correction factors used when you set the lever to a certain position (if you set the lever to an odd number 5 will be added to that number, if you set it to an even number 3 will be substracted). So if you set the lever to 3 door 8 will open. Setting the lever to 8 will open door 5. To open door 7 you therefore have to set the lever to 10 (10-3=7). That means leave the left lever position to number 2 and move the right lever to number 10. 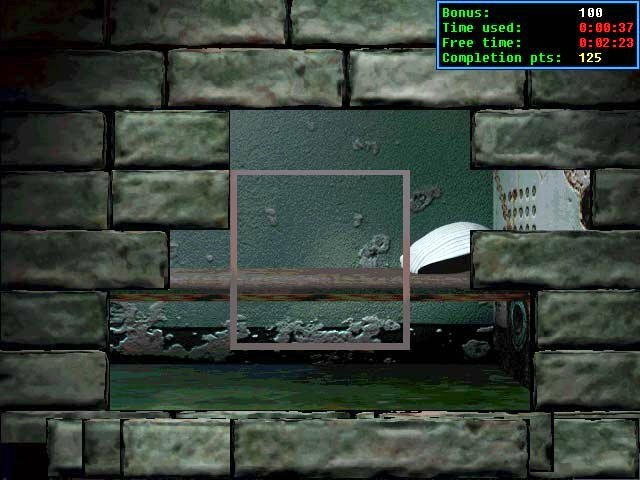 Inside the cell you'll find explosive in the red box. Then move to the Alcatraz dungeon. Q : How can I get pass the guard view to get the screwdriver ? A : Walk slowly until you can see the guard behind the glass door. Move the crates to the right. Duck and walk swiftly to the right (behind the crates). Keep on walking until you reach the end. Stand up and get the screwdriver on the top of the crate. Repeat the step to get back to the entrance. Q : How can I get pass the guard in the inner entrance of the office ? A : Use gas diversion. First, get the gas mask in cell block B. Move one of the chair there to reveal the gas mask. 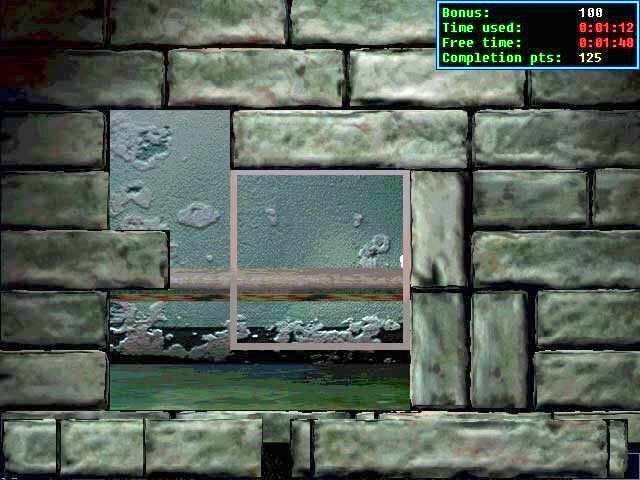 Then get the dirty filter from the room to the right of the entrance of Alcatraz dungeon (the green bag on the floor, examine it).Combine the gas canister, explosive, tape, and the filter to make a good time bomb. Look at the filter panel and watch how the cleaner droid change the filter. Go to the small path to the right (between entrance and the filter panel). Open the door and get the droid part on the floor. Use this tool to open the filter panel. Insert the home-made explosive in it and watch the cool movie. Q : How can I open the security door ? A : Use the security passcard on the keyslot. Q : How can I bypass the scanner ? A : Find something that can trick the scanner. Get the hairbrush behind the counter. Examine it to get the hair of Gideon. Use the hair on the scanner. Q : What is the passwords for the computer ? A : Insert each passcard with appropriate passwords. The answer is : A(Queen), B(Draw), C(Castle), D(Gambit), E(Bishop), F(Resign), G(Checkmate), H(Knight). You can read this answer from the note from the jigsaw puzzle. Q : How can I defeat Gideon in the chess match ? A : Follow this step to beat Gideon. Rd1, Rxe7, Qxd7, Bf5, Bd7, Bxe7. Total score is 3931 out of 4000. There are few things to do to complete the score. Please notice me if someone knows the additional score. This is a great game, in spite of several bugs at the ending puzzle. The mouse will freeze for some machine and video card. Any comments can be sent to vi001@csufresno.edu or vindrawan@hotmail.com after 1.5 year of this released hint. If someone know about some scores that I missed, could you tell me about it. So I could update this walkthrough. And I'll put your name on it. Happy Gaming !!!! All pictures are property of ACCESS SOFTWARE. Game Boomers - Game Cheats, and Walkthroughs for Boomers and the rest of you guys!